2017, No MPAA Rating, 120 mins. The new Netflix Original Film WAR MACHINE - based on the 2012 nonfiction book THE OPERATORS by Michael Hastings - is a semi-fictionalized chronicle of the firing of U.S. Army General Stanley McChrystal, who led a team in Afghanistan back in the late 2000's. Names and details have been changed in the film, but WAR MACHINE is not endeavoring to be a facts oriented docudrama, but rather an ultra black comedy and satire about America's troubled history in the Middle East...and the moral chaos and ethical madness of war and combat in general. The political targets that WAR MACHINE hones its crosshairs on are certainly thorny ones, not to mention that anti-war films are a proverbial dime-a-dozen. Satire in general is also not easy, especially when the subject matter is very recent and close to home for some. The main issue here with director David Michod's (ANIMAL KINGDOM) film is not with its lack of thematic ambition. No, the main dilemma here it is that it suffers from some terribly wobbly focus and some widely discordant execution. The film contains elements of, yes, comedy and satire, but it also has scenes that play out broadly like mad farces and then later ones that are solemnly dramatic, only then to be followed by more moments of cartoonish wackiness. 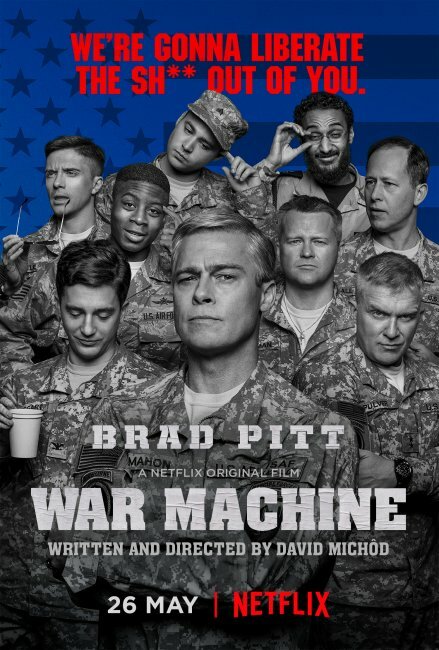 Throughout its two hour running time I had a great deal of difficulty disseminating (a) what WAR MACHINE was about, (b) what it was trying to say, and (c) whether it's trying to be a madcap comedy or sobering political/military drama...or both? There are moments of individual greatness here to be had, but those few solid parts don't fluidly gel together with the rest of the mismanaged whole. WAR MACHINE is thoroughly compelling, though, as a performance showcase for star Brad Pitt, who commits himself rather audaciously to his role of General Glen McMahon (a pseudonym for McChrystal), the commander of the U.S. forces in Afghanistan. Opening in 2009, during a time when the war in Afghanistan was going nowhere rather fast, WAR MACHINE details the clash between political interests back home and the military men and woman on the battlefront that are desperately - and somewhat naively - trying to change Afghanistan for the better. This is where McMahon steps in, a man that's respected and loved almost as a father figure by those that serve under him (they nickname him "The Glenimal). He's also the kind of leader that will abandon any comforts of his position by, for example, staying in a rundown room no better than those offered to his subordinates if it means being there for his troops. Even though McMahon is adored by those in his inner circle, he finds himself engaging in endless ideological battles with politicians back in America. His goal is to secure a particularly hostile area of Afghanistan and democratize it as a show of Yankee might and resolve, but he's constantly told to abandon such aspirations ("You're not here to win the war, you're here to clean up the mess," one politician grills him during one heated exchange). Unfortunately, the stubborn as hell general refuses to be a janitor and sweep the country's problems away; he's a man of war that's hell bent on making a Afghanistan a free nation. Armed with his most loyal men - Pulver (Anthony Michael Hall) and Little (Topher Grace) - and followed by a Rolling Stone writer (Scoot McNairy), McMahon hopes he'll succeed in his mission without budging an inch, even when it seems that the country's he's trying to "save" perhaps doesn't want saving. WAR MACHINE poses large thorny questions about American interests in Afghanistan, many of which don't have easily digestible answers. The heart of the film centers on the endless stream of setbacks and personal defeats for McMahon, and the character's staggering level of ever-escalating anxiety and frustration slowly eats away at his morale and soul. Pitt has arguably never given a more frankly bizarre, yet hypnotic performance in a film before as he does here as the emotionally beleaguered general. He not only plays up to the man's crusty, square jawed, and testosterone infused hubris, but he also has to suggest in other scenes a man of wounded vulnerability. It would be easy to write off Pitt's work as a wonky caricature - he delivers his lines with the grizzled inflections of an Aldo Raine from INGLORIOUS BASTERDS and has a lumbering physical posture (especially when running) that would put Bigfoot to shame. It's an unmistakably idiosyncratic performance that teeters on absurdity, which, I guess, matches the film's take on the war as one of mindless extremes. Some will come out of WAR MACHINE thinking that Pitt's methods here are a bit too on the nose and obvious, but I for one found him captivatingly strange; there's never ever a dull moment when Pitt occupies the frame. Pitt is supported by a finely assembled group of actors around him, especially from some unlikely sources like Anthony Michael Hall's barking and f-bomb obsessed second-in-command that's an unpredictable powder keg of hostility. I also admired Meg Tilly's brief, but memorable turn as McMahon's semi-reclusive wife that depressingly stands by her man despite the fact that the war has taken over their once loving marriage. There are a slew of other would-be significant characters (like Topher Grace's PR man) that seem woefully underwritten and marginalized, even when they manage to occupy scathingly funny scenes that generate ample laughs. Ben Kingsley shows up as the amusingly bumbling President Karzai, whom we first meet as he's vehemently cursing...at a Blu-ray player that's he's trying to connect to an outdated TV. WAR MACHINE has a final act that takes place on the war torn streets of a beleaguered Afghanistan region that - without divulging what happens - really cuts to the heart of the brutal and savage senselessness of war. Moments like that are sensationally effective, but they're nevertheless a distracting foil from other scenes that try to have a DR. STRANGELOVE vibe of acerbic outrageousness. More often than not, WAR MACHINE feels more like a series of unrelated vignettes that are messily strung together than a fully realized and unified movie. There's ultimately very little, if any, tonal steadiness in the narrative, and by the time the end credits roll by you're left puzzled by what transpired. Too much of WAR MACHINE wants to be a scathing character portrait, an equally sharp witted war comedy, and a nightmarish drama of what the battlefield does to young and disillusioned soldiers. But that's just it...there's too much going on in the film for its own good. WAR MACHINE is a mess, but it's a fascinating mess. Kind of like the war it covers, so maybe that's highly fitting.